Ooh, this sounds like fun, and the kick I need to get sewing something for my own home. We've just moved and as soon as the boxes are unpacked (we're getting close) I have ideas for making pretty things! i'll certainly be making something for this :) great idea, ladies! and thanks for organizing. This sounds fun! Love the "green" theme...I'm in! ooh! I cannot wait! I've been meaning to make new rugs for my kitchen, so I'm in! I'm in. I really want to make bags and baskets, so I loved the post to those fabric baskets. we just screened in our back deck so i was planning on making a quilt for the deck that we could also use to lay out there for the baby to play on. i picked out some fabric i love and found some old stuff at goodwill to cut up. this contest is helping me have a deadline to get started (hopefully today) and finish by the end of the month. i wanted an easy pattern with big blocks and less sewing so i am trying to make my own pattern for the "turning twenty" quilt. i will let you know how it goes. I'm in like Flynn! I've got a chevron quilt to finish so it's the perfect incentive to finish! Luckily it's part made with a (salvos find) old sheet. Ohhhh, I have just the project to make. Thanks for an excuse to get off my duff and finally do it. I'm in too - I need some new kitchen linens! Maybe my first project will be a notebook cover so that I can jot down ideas as I go. I love this idea and challenge, it will be fun to try and see what I come up with. 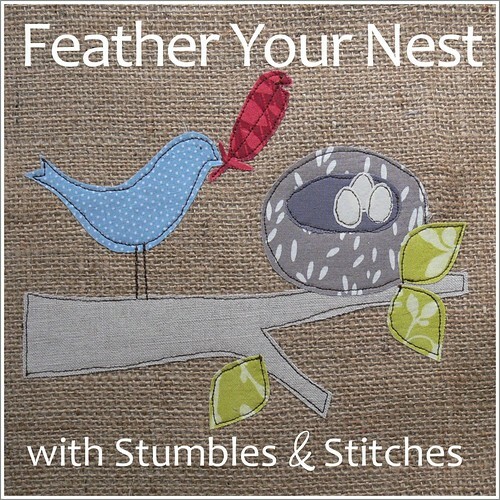 So nice idea, I should sew as crazy so many thinks I should repair or made for our nest. Alright, i'm biting the bullet...gonna do it! YAY! fun! I found this through your FB page , I'm in . I hope I can get something decent done in time .Thanks ! Okay, I am in....gotta find a good project! I have a ton of projects - it's the time I am concerned about but I am going to commit to making something- even if it ends up being some lame project at least I will have gotten something done! Sonds like fun! I'm definately in! I'm in--I never take the time to make anything to keep for myself so this is the perfect opportunity! I'm gonna try! I need some motivation to make something! Oh, what a fantastic idea. I'm so in. Count me in! I've never done anything like this before so very excited. Now what to make................? This sounds like so much fun! I am definitely in for this! Great way for me to expand my skills! I'm in! I'm cross stitching a wall hanging. This will be great incentive to finish and frame! Not sure what I'll make yet, but this should be fun! Please count me in! I'll be making a lap quilt! I'm in! found your challenge via Ellen over at the Long Thread. This is a good motivation for me! I've got a few projects in my head that are ready to come out. Maybe I can get them all done?! Wow what an awesome prizes! I'm definitely in :) My house needs some color and having a deadline is always good! Awesome..I can't wait to see all the projects. I have one in mind and will get started as soon as I can. Love this! Oh I need to make something...surely black and white or blue and white or ... I better start thinking and making! The possibilities are endless! Hope I,ll finde some time to post about mine project,but I'm looking forward to see what will others come up with. I'm in! Nothing like having a ton of projects on the go to get me crafting! This is going to be fun! Sign me up. This is great---I love to recycle/upcycle in my projects! Sounds fun, I'm real close to finishing a quilt and I want some throw pillows to match. Yes please!!! Making lots of things for my house atm - ad having a brilliant time! Hmmmm... I have a couple of things in mind. A chair that needs covering or some t-shirts that need repurposing. Alright, time to put all the fabric I've been collecting to good use. I just added my entry to the Flickr pool! Thanks for hosting, and can't wait to see the other entries! OOH, love this, I'm in, please sign me up. I just stumbled on this contest and I love the idea! With over two whole weeks left, I know I can come up with something. What fun! I have so much fabric to repurpose ... time to start thinking about some new projects! What a great idea! I have curtains and pillows to make to add some color to our living room. This will give me the motivation to focus and get it done. I will be joining in the fun! YAY! I already have a project in mind! I have an idea in mind as I type this! Oh awesome! My BFF just gave me a bunch of vintage tablecloths she had bought at a thrift store, and I was going to make some pillows with them so this is perfect! Yay! I'm signing up -hope can get a photo uploaded via my slow-mo-dialup line. Thanks for the fun. Marcia W.
Deadlines motivate me - I would love to join! I can't wait - I think I'll make some napkins! Hope I can make something by then! I'm in, love making things for the house! Perfect timing, I am painting my Livingroom and Dining room/Kitchen. I have been playing with colors and patterns for all new accessories. I have got a bunch of small fabric samples (1"-2") that I am trying to figure out what to do with. I can't just throw them away, they're too pretty. I've never done something like this before, but count me in. Hope I can make the deadline. Thank you for lighting the fire!. I'm in. My only delimna is the repurposed part. Hmmmm... Have a project that has just been sitting around and now I have inspiration to do it! 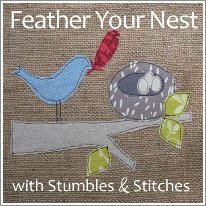 This sounds like so much fun and it will be my first sew-along type project. Sign me up!!! Can't wait! I made a pillow recently, but the only up-cycled element of it are the thrifted buttons I used for the back closure. Do you think this qualifies? Good! This is the incentive I need to make some things for my own house! I'm always making things for other people, so this is great. Thank you for putting this together. I'm in. I've been doing a lot of upcycling so now its time to figure out a project using those materials for me! I have never entered one of these group alongs but am looking forward to it!! Great idea!! I've been working on baby stuff lately - I need a little break to make something housey for ME!